A leadership conference designed specifically for Chamber board members and senior staff focusing on the impact of serving on a board, understanding duties and developing high-performance leadership can advance your organization’s mission and goals. 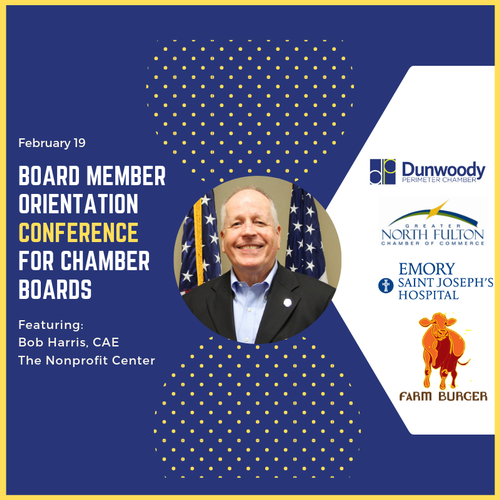 During lunch, attendees will hear from Candace Boothby, IOM, CCE, President & CEO of the Newnan-Coweta Chamber of Commerce as she provides great insight into the relationships between Chamber Executives and their Boards as well as best practices. Sponsorship opportunities are available for this event. Please click here for more information.You may register for these opportunities by reaching out to Britney Hardweare via email or at 678.244.9702.